Welcome the final installment of our Game In Progress review of Arkane Studios’ Dishonored 2. This concluding entry covers missions 7 through 9. You can find the rest of our review series right here. There are two kinds of levels in Dishonored 2: the functional and the novel. Functional levels present an assassination target somewhere inside an elaborately crafted set, whether it’s a ruined research institute full of flesh-eating flies or a sprawling conservatory turned headquarters for a coven of zealous witches. They provide ample paths forward for players of all styles—crowded rooms to terrorize with your gadgets and supernatural abilities, hidden passages to slink through undetected, and everything in between. Novel levels take all that and wrap it in a transformative bow. Last week, we talked about Kirin Jindosh’s Clockwork Mansion, a building whose rooms players can reconfigure at the pull of a switch. It’s more of the same. You’re sneaking through a gilded manor, searching for the megalomaniac you’ve been sent to kill, but that memorable wrinkle, itself a manifestation of the man you’re hunting, is enough to set it apart from the rest of the game and others like it. The back third of Dishonored 2 brings players through the best of both approaches. Mission 7, A Crack In The Slab, is the game’s second novel level, and it’s even more clever than the first. You arrive at the mansion of Aramis Stilton, Serkonos’ mining baron, hoping to find the intimate details of an occult event that happened there three years ago and gave rise to the villain who now sits at the head of your empire. But the place is in ruins and its owner is a babbling mess. Luckily, the Outsider, a mysterious deity who’s been helping you throughout your journey, hands you a magical device that lets you travel through time, between the dilapidated manor of the present and its ritzy former self on that fateful night. Visually, it’s a microcosm of the two sides to Dishonored’s world. Whether in Dunwall or Karnaca, most people live in squalor and struggle to survive. Everything is gray and crumbling, like Stilton’s modern-day mansion. But when you enter high society, everything is awash in pristine golden brilliance. A Crack In The Slab has you passing between those two disparate realities at the press of a button. The mansion of the past is a bustling place, full of hostile guards and skittish guests that you can skirt around using the collapsed walls and windows of the mansion’s present-day form, where the desolation lets you move around freely but caved-in corridors block the way forward. Time travel is also a method of escape, and a damn good one, too. Using the fractured lens of the Outsider’s device, you can plan for the perfect moment to strike while befuddled guards search for an intruder who just jumped three years into the future. More than at any other point in the game, A Crack In The Slab has you feeling like an otherworldly predator, capable of safely stalking your prey through a rift in time. It’s a little cheap, even when the advantage is theoretically balanced by the mansion’s negation of your powers, but after hours of suffering at the hands of these guards, it’s also a supremely cathartic turnabout. 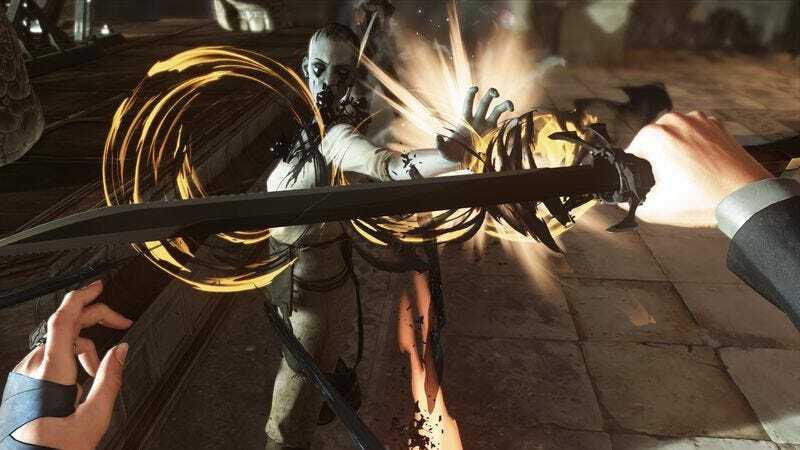 Mission 8, The Grand Palace, is the epitome of a functional Dishonored level. It doesn’t have a unique hook, but it’s a culmination of everything the game has thrown at you so far. Before you even reach the Duke’s seaside compound, you’re thrust into the surrounding neighborhood, a story-filled stretch of shops and apartment buildings that’s far more alive and welcoming than the other districts you’ve visited. The duke’s palace itself is a huge structure, and in true Dishonored form, it’s loaded with ways in, over, and around. The layout, lots of balconies to assault from above and surrounding cliffs to hide among, makes it the perfect playground to unleash what should at this point be your ample arsenal of destructive magical abilities. When it comes to escalating the challenge and melding all the lessons you’ve learned over the last 10 to 20 hours, The Grand Palace feels more like a proper finale than the one that follows. Mission 9, Death To The Empress, sees you return to Dunwall, retracing your escape route from the beginning of the game toward a confrontation with Delilah. She’s been busy while you were off tearing through the Serkonan aristocracy. Bodies of the city’s guards, your former protectors, litter the roads and hang from the streetlamps. You’re forced to walk through them, staring at this grim reflection of the havoc and pain your campaign has wrought. After the mechanical flourish of Mission 8, Death To The Empress’ more straightforward design feels like an anti-climactic step backward. It’s by no means a boring or poorly crafted level—frankly, after two games of assured, meticulous craft, I don’t think Arkane is capable of creating anything that isn’t at least fun to tinker with and impressive in its visual density—but without the hook of A Crack In The Slab or the mounting possibilities of The Grand Palace, it lacks the gravitas to feel like a satisfying cap to a game this diverse and propulsive. It doesn’t help that your confrontation with Delilah is an awkward attempt at a boss fight in a game where every character is equally vulnerable to a single, lethal sneak attack from your blade. It boils down to slinking around and offing a few more characters, just another handful of play things on which to prey. When it’s said and done, you’re treated to a “Where are they now?” style prologue, with a bunch of pictures and a voice-over letting you know what happened to your allies and the world of Dishonored 2 as a result of your choices—who you killed, who you spared, and how violent you were throughout the campaign. It’s an unsatisfying, pat way to end such an engrossing game, but it’s ultimately in keeping with Dishonored’s specialty. Like I said in Part 1 of my review, this isn’t a series that thrives on the big picture. Although the sequel’s plot ratchets up the intrigue and gives you a little more reason to care, it’s still threadbare. Dishonored’s spirit is in the details that give life to its skeletal frame—the hints of culture and history etched into every object, person, and place; the unique, meticulously constructed locations and the dozens of paths through them; the plethora of powerful magical abilities and the unpredictable ways they interact with each other and your enemies—and Arkane’s sequel overflows with them. No seriously, was anyone else shocked by how simple and easy that Delilah fight was? After seeing the story through, I really don’t understand why Corvo was included in the game as a playable character—other than to give people a man to inhabit. This is the story about a lineage of powerful women, and it makes way more sense as Emily’s journey than her father’s. I can’t even imagine how hard it was for the developers to implement your ability to see through time during A Crack In The Slab. There’s one really important plot thread that goes seemingly unanswered: Is Delilah lying about her lineage? If you finish the game without killing her, The Outsider seems to imply she’s telling the truth, which would make her a far more sympathetic character. The duke is an amazing painter. Purchase Dishonored 2 here, which helps support The A.V. Club.